Happy Valentine's Day! Oh..I think I'm a few days late. Must be the sugar coma I was in after eating this 16oz bag of Sweethearts in one sitting. 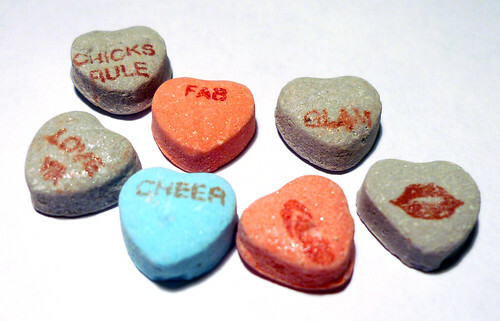 I don't do a lot of candy history and I certainly do not know as much about candy as Cybele over at Candyblog, so if you want to read about Sweethearts changing colors and flavors, please go read her excellent NECCO Conversation Hearts (Sweethearts) 2010 review. What I do know is that I'm drawn to sugar and corn syrup and that I like compressed sugar candy. I picked up this bag of the new, I mean the "Sparkliest, Tart-Sweetest Candy Ever!" at Wal-Mart in this gigantic 16oz bag for $2.00. What I forgot was that I also had an 8oz bag that NECCO kindly gave me at the 2010 Sweets and Snacks EXPO and my lovely wife had picked up the tiny 1 oz. boxes for my son to give to kids at school. That explains why I'm just now waking up from my sugar coma. You can sort of see how sparkly these new dazzled sweethearts are in the picture above. The darker colors had the best sparkle showing, the lighter colors, not so much. A few facts for water cooler conversations: They update the sayings and pictures on sweethearts every year, while recycling some classics. There are 80 total "conversations" found on this candy. They create 10 to 14 MILLION pounds of this little conversation hearts per year. To do that, they produce this candy 11 months out of the year, all for Valentine's Day. This is the tart package so the flavors include pink lemonade, wild berry grape, sour apple, extreme tangerine, watermelon and blue raspberry. I thought all of the flavors were good except the watermelon. I didn't care for the taste of that one at all. The sour apple and extreme tangerine were my favorite and I quickly ate most of those. Ugh...my stomach. So much sugar all at one time. What I like about Sweethearts is finding those chewy soft ones mixed into the bag. You know the ones I'm talking about. The ones where you bite into them and they just fall apart and melt in your mouth. So good. 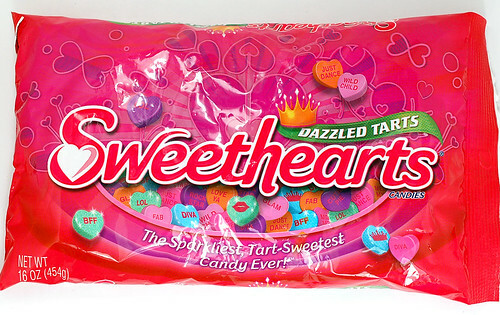 I thought these had a great flavor, I like the tart flavor more than I thought I would and I think I might like it slightly better than the regular flavored Sweethearts. I just ate a few more handfuls of these while writing this, so I'm going to go take a nap now. I'm not gonna lie to you Marge, sparkly food scares me.